January 28, 2013 in "baby"
Chris and I are making good progress on the baby's room. The painting is done, most of the furniture is set up, curtains are being hemmed... it's all coming together and I am pretty giddy about the whole thing. I think that it will be my favourite room in the house when it's complete. 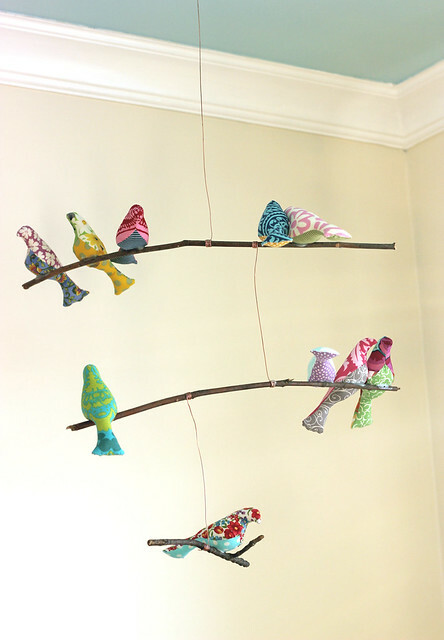 Remember all these awesome multicoloured birds I made in the fall? Well, they no longer decorate my mantel, they have officially been turned into a mobile and are now hanging above the crib. And let me tell you, it's just the sweetest scene ever! 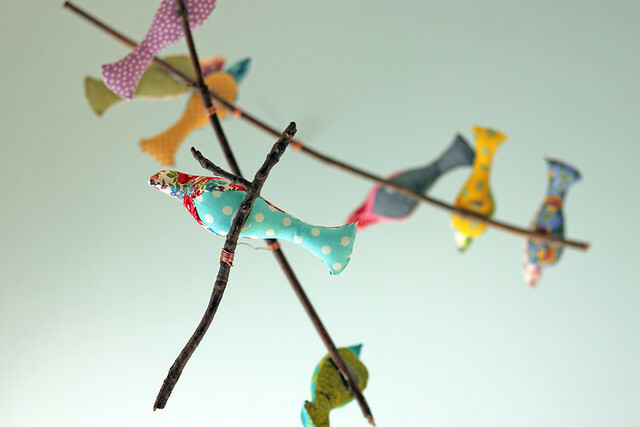 Mom and I spent an evening making all these birds, then Chris and I spent an afternoon assembling them into a mobile. And guess what, the whole project cost zero dollars and zero cents. That's right! It was completely free. Gotta love that. The initial plan was to use clear, inconspicuous fishing wire to hang the branches, but after tons of fiddling it became obvious that there was no way that Chris and I were going to figure out how to make that work. The branches kept spinning, the birds were all hanging upside down, we gave up and embraced the less subtle, but equally beautiful look of copper wire. 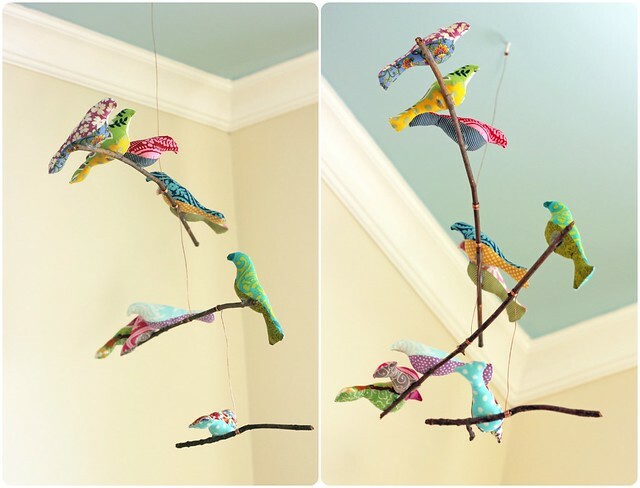 We used hot glue to affix the birds to the branches. Getting the birds to sit relatively well perched and balanced was no small feat. Honestly, I don't know how mobile makers do it... Chris and I kept thinking that you must need a degree in physics to get these things to hang straight! In the end, we managed, it's not perfect, but I think that the imperfections add to the sweet, rustic charm of this mobile. I love these birds and am really happy with how the project came together. Hopefully baby will love it too. I put my favourite bird on the bottom branch, this is the view the baby will have from the crib. Not too shabby! 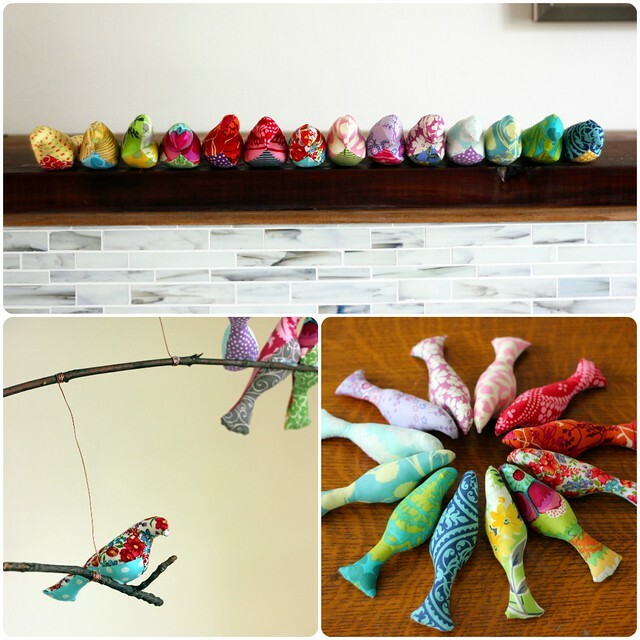 The bird pattern is a free download and can be found here.